The intensive phase of Jupiter encounter operations is winding down, but it's not yet over. In the first days of this week, we still have Radio Science Experiment (REX) and Long Range Reconnaissance Imager (LORRI) calibrations using Jupiter system targets, and some imaging to better determine the shapes and photometric phase curves of Jupiter's satellites Elara and Himalia. After that, the encounter becomes almost entirely magnetotail exploration using the Solar Wind at Pluto (SWAP), Pluto Energetic Particle Spectrometer Science Investigation (PEPSSI), and Venetia (Student Dust Counter) instruments; this final phase of the encounter lasts until mid-June. In the past week, we conducted more than 98 separate observing sequences comprising several hundred observations. I am sure that if you're reading this, you've seen some or the entire handful of images we released in the past week — such as the beautiful LORRI imagery of Jupiter's Little Red Spot and Io's Tvashtar volcano. Well, those data represent less than 1/1000th of what we still have to send down, including color imager, more high-resolution LORRI shots, ultraviolet and infrared spectra galore, and, of course, plasma data. So while the "tip of the tip" of the iceberg is now on the ground to whet appetites, we won't have the entire dataset we've taken - all 36 gigabits! - on the ground until at least late April. But don't despair, we will begin downlinking operations this Wednesday, March 7, and will be sending back a few gigabits each week. So you should expect to see nearly weekly data releases coming from New Horizons throughout March and April. 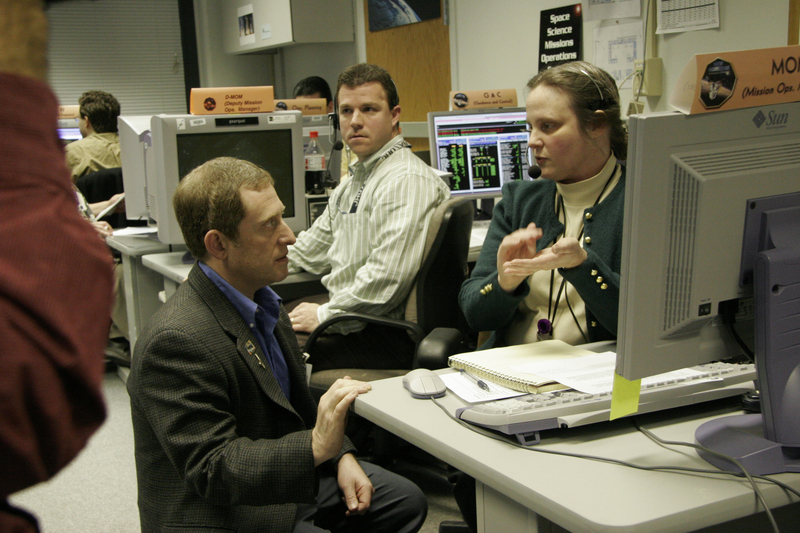 New Horizons Mission Operations Manager Alice Bowman gives Principal Investigator Alan Stern an update following the spacecraft's closest approach to Jupiter on February 28, 2007. 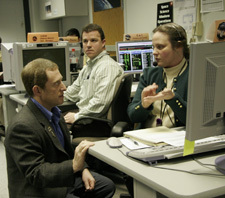 Behind them, Deputy Mission Ops Manager Nick Pinkine monitors the spacecraft status screens. Both the mission and science operations teams will have much more data to downlink from New Horizons in the coming months. As things settle down on the spacecraft, we've already begun planning the last portions of our instrument payload commissioning tests — things we put off until after the rush of the Jupiter encounter. 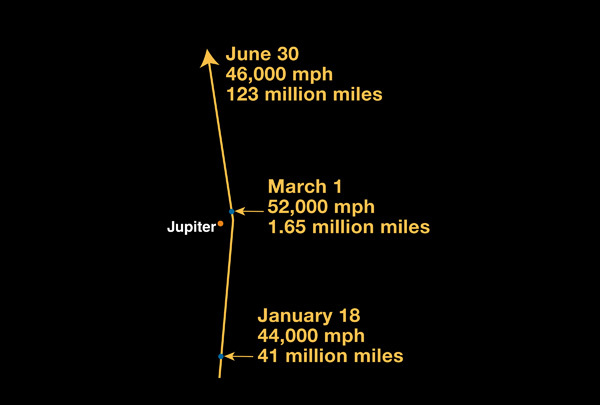 We're also planning some hibernation-mode testing for April and a tiny, "jogging speed" course-correction maneuver on May 23 to trim up our trajectory. That's it for now, but I'll be back with more news and views soon. Meanwhile, keep on exploring, as we do!